honest, open, and respectful conversations. TrueChat is a podcast network on a mission to create more responsible media. Our content is free, on demand, and has no commercials. We produce TrueChat Original programs and partner with organizations to create podcasts. We are supported by our clients who contract TrueChat to produce, publish, and promote podcasts for them (podcasting as a service). Some of our clients have co-branded podcasts and endorse TrueChat’s mission and others are standalone programs. Learn more about how you or your organization can start a podcast with TrueChat. At TrueChat we believe there is nothing more important to a democracy than an informed electorate. Opinions don't ruin journalism, but allowing viewership to drive content does. We make every effort to expose our audience to as many opinions as possible and share our principles of objectivity. TrueChat's mission is to educate people by providing honest, open, and respectful conversations. Jon Umstead, host of Business is ART, on a show with a call-in guest. TrueChat was founded in 2011 on the principal of change. Justin T. Weller conceived the original idea of TrueChat and shared it with his best friend Camden Pierce. The duo began broadcasting local sporting events and also talked politics once a week. Justin was fed up with the status quo in news media and politics, hence The Current Issues Show was born. Justin and Camden were quickly joined by a former educator of 30 years, Lance Jackson. With a philosophy of real people and honest opinions, this show would pave the way for the ideology surrounding everything at TrueChat. After a fun three and a half years, TrueChat transformed into a national media network with multiple shows spanning various categories. Without the efforts of others and a willingness to keep an open mind, TrueChat would not be where it is today. Justin and Camden had 8 listeners on their first show. Today, TrueChat has reached over a million people. From our staff to all of our outside contributors, community and teamwork are what make our endeavor possible. TrueChat has a Board of Directors made up of staff and local educators. Including part-time volunteers, our staff, and the Board, TrueChat maintains a team of about 30 individuals that make our endeavor possible. We aim to involve the youth of our community and combine that with the experience and wisdom of the most seasoned leaders. 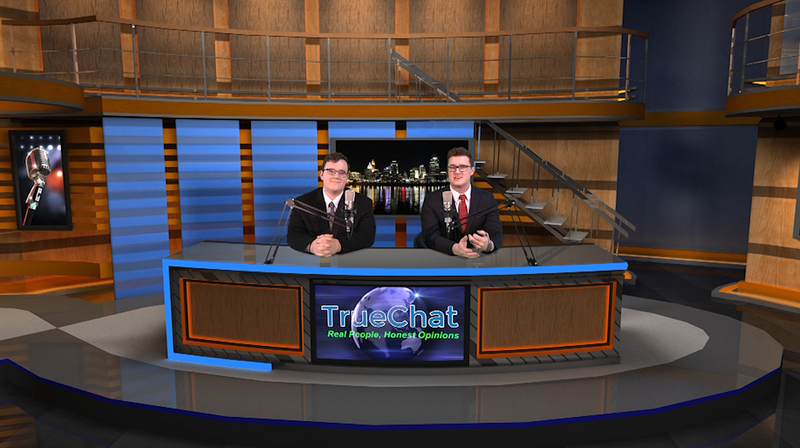 TrueChat’s audience ranges from ages 12 to 90 and from people interested in sports and pop culture to those who enjoy political debates. We have a diverse audience that desires to be engaged in TrueChat and promote positive change in society. TrueChat's people are what make our endeavor possible. Our founder and directors work with our team on a daily basis and our organization utilizes a team approach to all efforts. We get everyone's feedback because it makes us better. From Partnership Specialists to Producers and Personalities we are each a part of the greater picture. Together, we work to accomplish TrueChat's mission and to create a new, better standard for media.